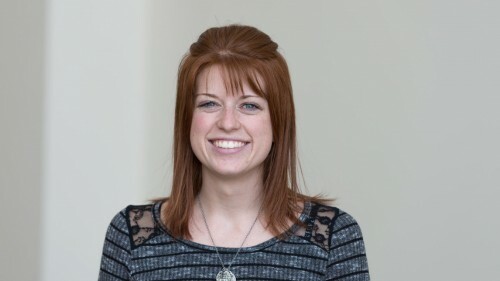 Junior Courtney Wiese, Henning, Minn., is one of five students awarded a 2019-21 Phillips Scholarship through the Minnesota Private College Council (MPCC). Colleges in the MPCC were allowed to submit three qualified candidates for the scholarships. Thirteen applicants from eight campuses submitted proposals with students from St. Catherine University and Augsburg receiving scholarships along with Wiese. Students receive a total of $12,000 in scholarships, a stipend of $4,000 for work they will do during the summer of 2020, and $500 to support their summer project. “I was interested when I found out that the scholarship was not only going to help me in my education but would help others that would be involved in my project as well,” Wiese said. The Phillips Scholars Program, funded by the Jay & Rose Phillips Family Foundation of Minnesota, supports private Minnesota college students as they design and implement self-directed community service projects. Since the Phillips Scholars Program began in 1994, more than 50 students have received the award that continues Jay and Rose Phillips’ legacy of service to others. Wiese’s project is “Broadening Their Horizons: Helping Low-Income Students Access Scholarships for College.” She plans to create a three-part program to work with low-income students in her hometown of Henning. She’ll educate, encourage, and equip students to seek out and enact service engagement that will support their resumes and scholarship applications that she will help develop. Wiese believes the best part of her project is that it won’t just benefit the community once, but will continue to create opportunities for youth to be active and involved in giving back to the community. “When creating the project, I continually thought about my own narrative and the impact that community service has had on me, and I want other students to experience the benefits of it as well,” Wiese said.